Overlook Estates is a wonderful luxury home community located off of CR 273 and Crystal Falls Parkway in Leander. These residents enjoy custom homes on acreage sites of app. a half acre. This luxury home neighborhood is a hidden jewel of large trees, scenic views, and peace and tranquility. Residents also have great access to schools, shopping, fast toll roads, as well as the new Cap Metro Rail station. You can be at the new Cedar Park Events Center, 1890 Ranch shopping center, or the new Schlitterbahn Water Park in less 10 minutes. Residents commuting to Austin, Cedar Park, Georgetown, Pflugerville, or Round Rock should also have a fairly short commute. 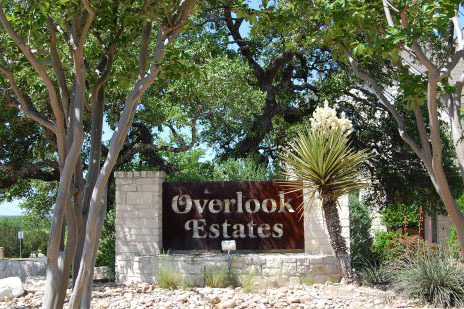 Homes for sale in Overlook Estates in Leander typically run from the $300's - $500's. Pleasant Hill elementary, Knox Wiley middle, and Rouse high school.